Tastefully decorated newer four bedroom, two bath, executive home for rent in Kissimmee/Orlando area. Picture yourself relaxing in your large pool or the whirlpool spa at a secluded spot with a wildlife conservation area behind you. Privacy abounds. THIS IS TRULY A PRIVATE VILLA!!! You can enter the lanai/pool/spa either through the Great Room or from the Master Bedroom. You will love the huge lanai/patio area and the extra-large pool. It's great to relax in your spa after a busy day at Theme Parks, or let the kids swim without worrying about a pool closing time or concern that someone might splash a stranger. The large Master suite has a King-Sized bed, the master bath has a large Garden Tub and a separate shower! This suite has sliding door access to the pool and spa. Total of 4 Disney-Themed Bedrooms and 2 Bathrooms make this 1900 Sq. Ft. Villa perfect for any sized family. Minutes away from Disney World, Universal Studios, SeaWorld, and Holy Land Experience. Convenient interstate access to Tampa, beaches on either coast or to Kennedy Space Center. Beds: 1 king, 1 queen, and 4 twins. Amenities: Screened-in pool with whirlpool spa, air-conditioning, beautifully decorated, washer/dryer, linens & towels included, telephone (free local calls), dishwasher, microwave, toaster, coffeemaker, dishes/utensils provided, three cable TVs, VCR, DVD, free Disney movies, CD player, FREE HIGH SPEED WIRELESS INTERNET. Extras: Portable crib, high chair, screened-in pool porch, pool toys, formal dining room, great room, located on large lot (1/4 acre). 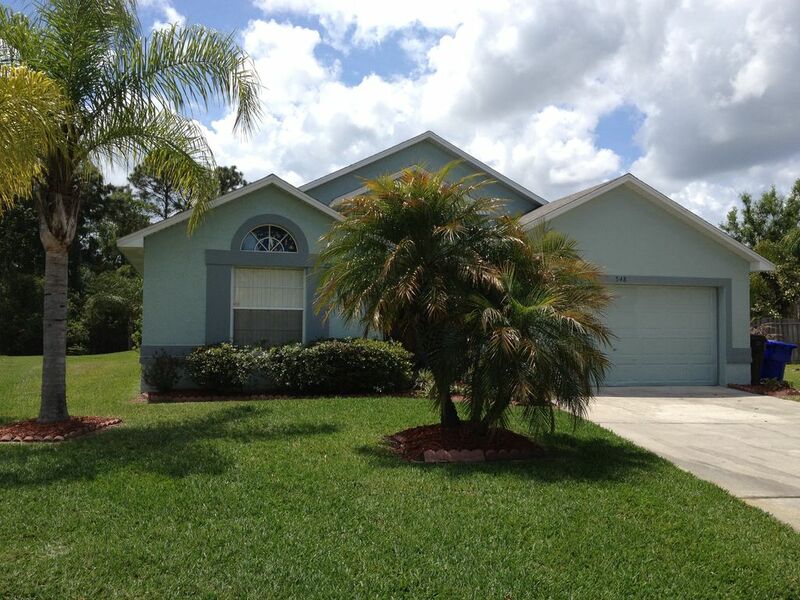 Restful spot in quiet community, yet near all Orlando activities. Florida Oranges - many near-by stands. Area: This Villa is in the Heart of Disney country. Yet you have piece and quiet. You can go to the noise of Theme Parks or 'glitz' of Hwy. 192, but you don't need to stay there. It's the best of both 'Worlds'. The community is quiet, the Villa is secluded and spacious, and the commercial activities are near. You will love it, and you will be back! Beautiful property! Pool is great! The home had everything we needed and the location was ideal. We will definitely recommend it to friends and family. I can't say enough about the gorgeous pool. House layout is very open too. Glad you appreciated it. We do our best To keep it nice. Clean, nice and large. Wonderful pool and hot tub. Close to so many things to do. The owner Mel, was an absolute pleasure to work with. No issues at all. All the amenities one would need. We just spent one week at this home and it was above and beyond expectation. Everything was delivered as promised. The area is very quiet and kids friendly. Best Vacation Yet n Florida! We just got back from having the best vacation in Florida...thanks to Mel Olberg for the use of his home. This private oasis was exactly what we needed with our grandchildren and daughter after a very tough year. He was very quick to accommodate us when our flight was cancelled and had to spend another night in Florida. He quickly made other arrangements (he was scheduled to fly in) and let us keep the house an extra night! Clean and very well maintained by Bob - who was quick to come and turn the pool heat back on after we decided to spend another day. Thanks Mel for some wonderful memories for us to bring back home to Ottawa, ON. Canada. We would absolutely rent from you again when we decide to return to Florida! We really enjoyed staying at this house for our summer vacation! We loved the private pool and it was easier to keep an eye on our 3 kids swimming here at the house rather than a busy public pool. The house was very clean and the pool was amazing! The house is only 10-15 minutes away from the parks which was perfect to be close to everything and yet separated to have some down time as a family. It was perfect for our family vacation! We have spent many vacations at your house and love it! The pool is beautiful, which is where we spend most of our time! The house is close to lots of shopping and the theme parks. Thank you for many wonderful vacations and we look forward to coming back soon. Villa is conviently located near all Orlando/Disney attractions. It is minuites away from weekly acitivities at Celebration City and Old Town. Just a short drive to Gulf of Mexico and Atlantic Coast beaches.